(Beyond Pesticides, December 7, 2017) European health and environmental groups Global 2000 and Pesticide Action Network (PAN) have announced plans to sue European Union authorities over their assessment of the herbicide glyphosate, the active ingredient in Roundup products produced by the chemical company Monsanto. The groups claim that the German regulatory authority, the Federal Institute for Risk Assessment (BfR), and the European Food Safety Authority (EFSA) used material directly from Monsanto in their report over the safety of glyphosate without making clear that the data came from Monsanto itself. “Both the BfR and the EFSA were in breach of the requirement obliging them to make an independent, objective and transparent assessment,” the groups said in a statement provided to Reuters. PAN and Global 2000 filed legal complaints with investigators in both Berlin and Vienna, and plan to follow up with suits in France and Italy. The groups cite Austrian criminal code in their complaint, which indicates that “incorrect or falsified data” could be cause for commercial fraud. The two groups are also alleging that EFSA and BfR willfully endangered the public and the environment. Although the next steps are unclear, groups indicate to Reuters that they plan to work these cases through domestic courts and eventually toward the European Court of Justice. 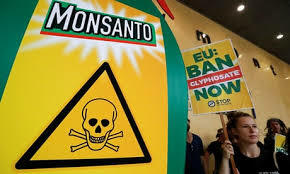 The lawsuit against these agencies comes as the European Commission of 28 member states voted late last month to extend the allowed use of glyphosate in the continent for five years. The close vote, which saw nine against, and one abstention, pitted Germany against France, with the former country winning out after swaying the vote in favor of continued allowance of the chemical. Despite the decision, France announced it remains committed to eliminating the herbicide from use within its home county as soon as possible, and will continue to engage at the pan-European level to abolish glyphosate use. Both EFSA and BfR have been accused of working closely with Monsanto to sway their final decisions on the controversial chemical. In 2015, reports indicated that BfR based its glyphosate renewal assessment almost solely on industry science and classified industry reports from an industry greenwashing group called the Glyphosate Task Force. It was also found that three scientists on Germany’s scientific panel on pesticides work for the pesticide industry. In 2017, another report found that EFSA copied “dozens of pages” of documents submitted by the Glyphosate Task Force when it released its renewal assessment report recommending continued use of the chemical. Beyond concerns over collusion is the fact that neither BfR nor EFSA looked at formulated glyphosate products like Roundup. Both evaluations, including of course the Glyphosate Task Force evaluation, only considered pure, technical grade glyphosate in their assessment of the chemical’s health impacts. When the World Health Organization deemed glyphosate carcinogenic, it looked at the health effects of both the active ingredient and formulated products such as Roundup. Monsanto indicated at the time of the report that EFSA wrote it the way it did because of the large number of studies that it needed to assess. However, both EFSA and the German regulatory agencies continue to refuse to disclose two key chronic toxicity studies that were pivotal to the decision, citing them as confidential business information. While the EU five-year authorization is a setback, environmental and health groups will continue to challenge these decisions in the courts, as well as at the national level within EU member states. The U.S. is no less subject to the influence of multi-national chemical companies like Monsanto. Eliminating glyphosate and other toxic chemical use in the U.S. may also require continued court action, such as the numerous personal injury lawsuits against Monsanto’s Roundup, as well as sustained grassroots advocacy. Start your own local movement to stop toxic pesticide use in your community by arming yourself with the latest science on toxic chemicals and their alternatives, building a coalition of concerned residents, and taking your concerns to elected officials. Contact Beyond Pesticides at [email protected] or 202-543-5450 for assistance. This entry was posted on Thursday, December 7th, 2017 at 12:00 am	and is filed under Uncategorized. You can follow any responses to this entry through the RSS 2.0 feed. You can skip to the end and leave a response. Pinging is currently not allowed.